Over recent times, Australia has become one of the true unsung heroes of world cinema. Never afraid to push the boundaries with innovative hard edged productions, while also managing to unearth some of the next big stars which will undoubtedly dominate the Hollywood blockbusters for years to come. Following in the footsteps of films such as the astounding Chopper - which herald the arrival of Eric Bana onto the world stage - and the classic Russell Crowe film, Romper Stomper comes début director, David Michod's cold, crime thriller, Animal Kingdom. The film tells the story of young Joshua (James Frecheville), reeling from his mother's death through a heroin overdose, as he's forced to live with his estranged grandmother and uncles. As the film progresses it's evidently clear that Joshua's extended family are heavily involved in ambiguous illegal doings. The audience quickly learns it's seemingly not this band of crooks he should be afraid of, but instead the bunch of corrupt, trigger-happy, cops hell-bent on gunning them down, one by one. Personally I found the film a bold and refreshing experience, especially in the light of how much average tosh I've suffered through lately. It conjured memories of early Tarantino mixed with Guy Ritchie's best work, at their most gritty and visceral. While, like those films it was, at times darkly comedic, it never once cheapened the feature with an over-saturation of sheer silliness. The film was also rooted firmly in basic family values and age old clichés such as blood being thicker than water, with broodier twists akin to last year's phenomenal, Winter's Bone. This feeling was compounded by the fantastic and under-stated performance of James Frechville, who I would love to see more of in future. He didn't so much lead the line, like Hailee Steinfeld did in True Grit, as a shining light of moral goodness but tragically became a victim of circumstance as a result of his uncles' erratic actions. Bringing us onto the uncles in question, they were all simply brilliant. The best probably being the oldest, Andrew or 'Pope' played by Ben Mendelsohn was gloriously cold and twisted, buried in his own mental problems resulting in perhaps being the more brutal and notable of the four. The leading performance of the whole feature, and whom quite rightly deserves her Oscar nod, is Jacki Weaver's bloody terrifying portrayal as the mother of the four brothers, and grandmother to Joshua. She sort of reminds me of Barbara Hershey's role in Black Swan, very passive but deep down very devious and quite a disturbing proposition as a whole. If this year's award season for any Best Supporting Actress category has taught us anything, it's play an emotionally repressed and wholly sinister motherly role and you're seemingly guaranteed a nod - also see Melissa Leo in The Fighter. Special mention must go to Guy Pearce, not necessarily the most memorable performance of his career, but interestingly starting to carve a little niche for himself. He hasn't so much starred in many films in recent memory, but consistently lends his class to so many truly brilliant films, such as The King's Speech, The Hurt Locker and was one of the few highlights of last year's maligned adaptation of Cormac McCarthy's The Road. In Animal Kingdom he kind of channels some darker hybrid of Gary Oldman's Jim Gordon from the Batman films resulting in a strangely likeable performance. Director, David Michod must also be commended for creating such a mature piece of cinema, upon first time asking, containing rustic elements of unrivalled independent features mixed with grand, ambitious, mainstream sensibilities. This isn't necessarily just an art-house film, this is simply a beautifully crafted thriller which could give Martin Scorsese a decent run for his money. The rich, stylish camera work, the gritty urban shots. Absolutely gripping. Smart direction and outlandishly classy performances are the law of the land, in this kingdom. A broody, brutal and stylish crime thriller, exploring the moral compasses at both ends of the law. Expect to see Frecheville in plenty of films to come, after a solid début, and it'll be interesting to see how David Michod follows the weight of expectation from this impressive first outing. Watch it. Enjoy it. And just be bloody thankful Jacki Weaver's Janine Cody ain't your gran. 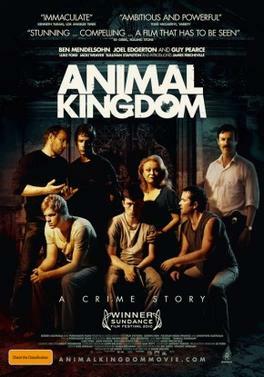 Animal Kingdom is in selected cinemas throughout the UK from Friday February 25th, 2011. It seems to fall right into my comfort zone! Who doesnt love and early ritchie-esque flick? I totally agree about Pearce. He is a great actor. INfact "Memento" is on my re-watch list for this week. I'm interested to note that this film hasn't yet played in the UK. It played here in NZ last October!! A really good review you have written as it is a fine film and one the best to come out of Aussie for some time. I hope that Weaver wins a Oscar for her role as she is one chilling old maid.